Do you often feel lonely even when surrounded with people? The great irony is that as we become increasingly “connected” — on social media, video calling, and messaging — we simultaneously feel increasingly lonely. And even though we may use technology to feel more connected, it may be exactly what’s leading us to feel lonely. 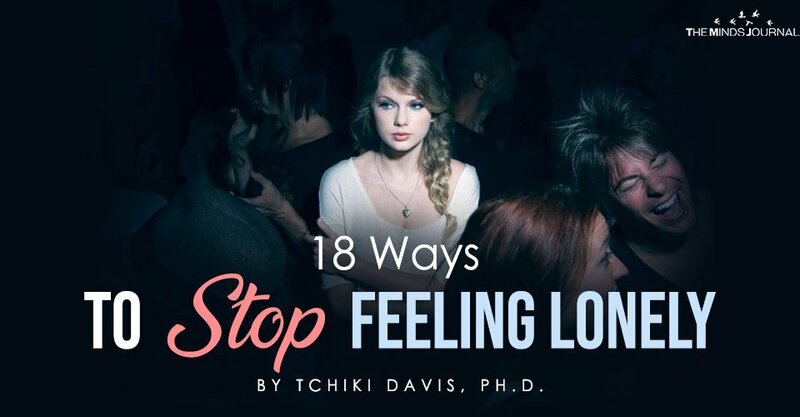 If not, try some of these 18 strategies to stop feeling lonely. In difficult moments, it’s essential to practice self-kindness. Blaming ourselves when we feel lonely is not helpful. So limit your hurtful self-talk, engage in some self-care, and just generally give yourself a break. Perhaps a walk in nature or a day at the spa may be helpful for getting yourself into a self-kindness mood. 2. Capitalize on the present moment. When you feel good about something, share it with others right away, and I don’t mean “share” by posting on your social media. You could share by calling or texting a friend. Or share with the people you work with. By sharing these moments, you create small moments of connection with others that can help you overcome loneliness. 3. Connect in real life. Connecting in real life may not be as easy as it once was. We often default to using our smartphones — it’s easier, and now it’s culturally accepted. But we can decrease our loneliness if we build stronger in-person connections. We do this by looking people in the eyes, listening, being mindful, and choosing not be distracted by our phones or other technologies. 4. Rethink how you spend your spare time. When we feel lonely, sometimes we just want to retreat into a corner and hide. Other times, our endless to-do list may leave us too exhausted to go out and be social. But opting to stay alone every night with our phones, watching Netflix, or playing on Facebook can really get us stuck in loneliness. We’ve created a life for ourselves that deprives of us of meaningful social connection, and the only way to get out of it is to start living differently. If we instead use our loneliness to motivate us to reach out to people, then we can strengthen our relationships. By opting to cope with our loneliness by seeking out social support, we create more social moments with the people in our lives who matter to us, which usually reduces our loneliness. 5. Do more things with people. Engaging in face-to-face social interactions tends to improve our mood and reduce depression. Activities that involve other people — such as attending religious services or engaging in sports — are also likely to have positive effects on our mental health. So find ways to be around people more. A growing body of research suggests that even seemingly trivial interactions with strangers — like chatting with a barista or cashier — may be able to keep loneliness at bay by helping us feel more socially connected. So reach out to other human beings to say hello, ask them how they are, or chat about whatever’s on your mind. These small acts can make a big difference and help you reduce feelings of loneliness. Instead of passively surfing the net or your social media, if you want to go online, opt instead to do something that involves the active participation of other people. For example, you could play games with others, chat about something you care about, give advice on a forum, or have a video call with a friend. The more you interact with others while online, the more connected you are likely to feel.